Weather-wise, winter is not the ideal time to travel in the People's Republic of China. But the month of December can have one perk: It's a low period of travel for domestic tourists so major tourist destinations won't be terribly crowded and rates for hotels and airfare can be much less expensive. You can also see some of the country's most famous attractions, like the Great Wall and the Yellow Mountains, covered in snow—a completely different perspective than the summer months. Additionally, if you're planning on visiting Tibet, December is the month to do so. While it is very cold in Tibet in the winter, this is the pilgrimage season so you'll be able to see many farmers, having left their farms for the season, making their way to holy sights for prayers and offerings. In December, China can have nose-numbing, cheek-freezing cold in the north, whereas it's bone-chilling damp and chilly across the central part of the country. The southern part of China will be milder: You'll find cool to warm temperatures but it will still be damp, but not as damp as it could be later in the winter. If you'll be in Beijing or other parts of northern China, rainfall in December is at an annual minimum so you can probably count on a dry day at the Great Wall. There is little snowfall, but it's usually so cold that whatever accumulation does occur stays on the ground until temperatures increase. East China, including Shanghai and much of the Yellow Mountains, typically stay above freezing but can be windy and damp. Central China is cold and quite dry—many buildings in this region do not have indoor heating systems. In contrast to much of the rest of the country, South China has pleasant wintry weather that is almost always above freezing. Hong Kong is usually warm and sunny with blue skies and light breezes—a large departure from summer's heat and humidity. Layers are essential for traveling in China, but especially so during winter weather. 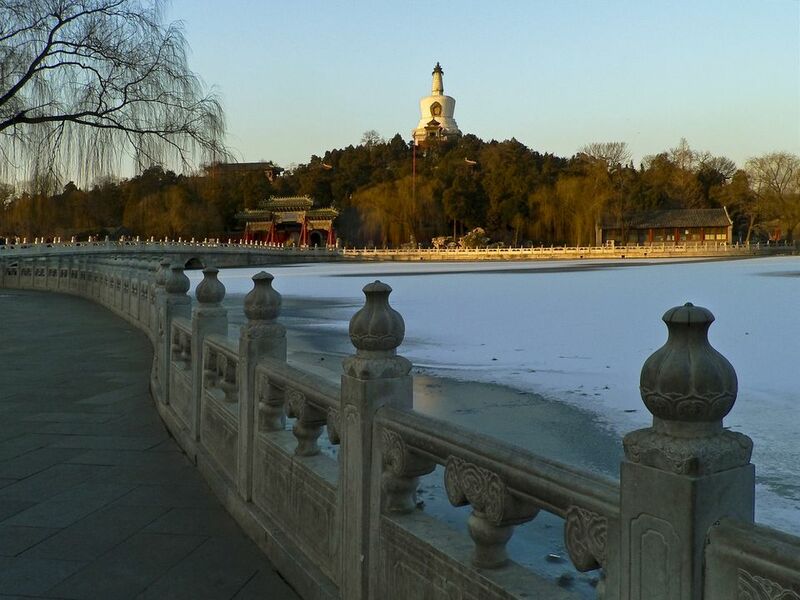 Don't underestimate how cold it will be if you're planning to travel to Beijing. You might even consider a ski mask because it's just that cold—and if you're planning on a trip out to the Great Wall or a day walking through the Forbidden City, you'll be thankful for long underwear, good gloves, and a hat. In the North, it will be cold during the day and below freezing at night. Pack a light pair of long underwear, a fleece, and a wind-proof or down jacket. In central China, it will be quite chilly during the day and cooler at night, but rarely freezing. A heavy base layer (jeans, boots, and sweaters) along with rain or wind-proof jacket will be enough. Meanwhile, southern China will still be relatively warm, and the farther south you go, the less harsh the weather in winter. By the time you get to Guangzhou, you'll be stripping down to just a light jacket. Late fall dressing is fine but pack something lightweight for the occasional cool evening and rainy day. Regardless of where you're visiting, weather-proof outerwear and plenty of layers that you can add or remove depending on the outdoor temperature. December is a quieter month for events and festivals in China, but there are still a few things for adventurous travelers to do. Hong Kong gets into the Christmas spirit with tons of decorations and lights up on Christmas Day. Christmas Day is also a huge shopping day in the city, with many stores holding large sales. Winter Solstice: Some Chinese celebrate the Winter Solstice, which is usually on December 21, 22, or 23. On this day, families will gather to eat dumplings or tangyuan, a Chinese dessert of rice flour balls in a sweet syrup. Harbin Ice & Snow Festival: While it sometimes begins in early January (dates vary from year-to-year), this is one of China's most popular events. Thousands of visitors brave the freezing cold to see incredible ice sculptures that are lit from within. Chinese New Years: Celebrations don't usually kick off until February, but cities like Hong Kong will ring in the New Year with an incredible countdown and fireworks display on Victoria Harbour on December 31, New Year's Eve. December is one of the best months to visit the Great Wall, especially if you're hoping to have this incredible historic treasure all to yourself. China is becoming a more popular ski destination. If you want to ski while you're in China, ski resorts in Northeast China and those near Beijing are good options. If you wish to visit Tibet, permits are obtained much easier during December and the surrounding low season than at other times of the year. Travelers can also stay for as long as they like at Potala Palace, whereas their time is limited during the high season.